If you have more than 50 lbs you would like to lose then there are a few more questions for you. Which of the below would you prefer? Rapid Weight loss? – select this if you would like to lose weight as swiftly and safely as possible. Long term health? – select this if you are more interested in losing the weight and learning a totally new lifestyle so when you do lose all the weight you want to – it stays off because you have learned a new and healthy way of life. Build muscle? 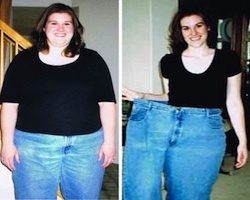 – Even though you have over 50lbs to lose you can still go on a program that will do both. Lose all that weight and at the same time really pack on muscle mass. These programs use the body fat storage as effective fuel to pump up your muscle size. Trim and tone? – More than just a diet regime. Learn how to do physical resistance training in such a way you will drop the fat and reveal that beautiful, long, sleek body you’ve been hiding all these years. ‣ Do you have Saboteurs in your life? ‣ Try this to tighten up "Bat Wings"
‣ Why eating THIS never worked! ‣ Do you have an old lawn mower?